Suzenn Roff’s book “What Makes You, You?” is a philosophical, in-depth work that takes the reader on a journey through a life of positivity and acceptance of one's self. 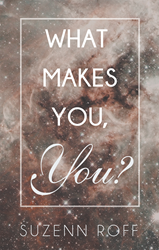 Recent release “What Makes You, You?” from Page Publishing author Suzenn Roff is both telling and enlightening; this work shares the author’s experiences and how the author has changed her life for the better. Suzenn Roff, a positive thinker, devoted writer and author, has completed her new book “What Makes You, You?”: a gripping and potent work that aims to show the reader that life is about love, acceptance and gratitude. “Life is truly amazing and deserves our gratitude and appreciation moment by moment. We are creating our lives as we live each day. Thinking is creating. We have the ability to make any change as we go along,” said author Suzenn Roff. Published by New York City-based Page Publishing, Suzenn Roff’s informative work will open the reader’s eyes to the potential of happiness in all aspects of life. This book is designed to awaken the reader to the possibilities that are available to them through their energetic imprint. These are thoughts and practices to take steps to make changes, which will change the reader’s understanding. Roff concludes by saying, “Your personal energy is powerful. It affects not only you but also everyone around you. Everything you experience in your being, every thought, feeling, and belief is visible to others whether you are positive or negative. Every emotion that passes through your conscious being is energetically seen by (and has a powerful effect on) others on a vibrational level. Readers who wish to experience this inspiring work can purchase “What Makes You, You?” at bookstores everywhere, or online at the Apple iTunes store, Amazon, Google Play or Barnes and Noble.